It's almost time for the new year and along with a new year comes new obsessions. Until then though, I'm still enjoying these plate walls and I hope you are too. Find the plate wall archives here. It's not on my blog today, but I am offering not one but TWO items from my shop! The lovely Iva Messy is hosting the giveaway. 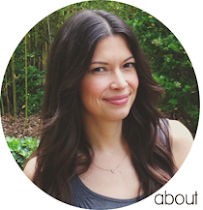 If you aren't already a fan of her blog, you should be because she's awesome. Thanks Iva! Enter the giveaway here. I hope you have the loveliest of lovely weekends. Those rooms are AMAZING!!! I love plate walls! And I love your blog!!!! Yup it's official now; fab obsessions of yours! Yes I am loving them as well, I especially love the look of the first photo. thank YOU Christina!! ;) you are awesome! I think the plates above those two beds are so fantastic!! I hope you have a fabulous weekend! Everytime I walk in to Anthropologie I think of doing something with plates as decor! LOVE the plate wall posts. 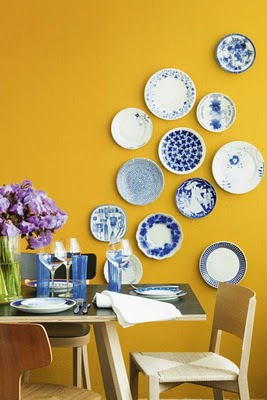 The bright yellow with blue and white plates one- what a super-great design!! And thanks for the giveaway! Your shop has grown tremendously!! my walls need some plate action! for reals! although today i would rather THROW plates than hang them! not literally -- this damn cold is making me SUPER grouchy. tmi. tmi. Love the last three rooms! Just briefly stopping by with my very best wishes for Xmas and the New Year & to say how much I’ve missed your great posts since my last visit - but hope to see you very soon back at my place where I’ve just posted my latest Christmas Lola Lifeline! All the best & see you again soon! I like the black and white room. great plate walls! 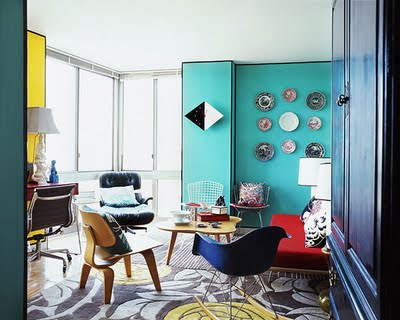 all so striking...i especially love the yellow and blue. I just love that bird plate! And have always wanted those Fornasettis--actually they would look pretty good in my house now that I think about it! Wishing you a very cozy and warm weekend! The second and third walls are soooo pretty! I've never thought about putting plates on a wall, but hey, it works. Wanted you to know that I've started my very own plate wall. My kitchen walls are granny smith apple green. I'm awaiting the arrival of the first three vintage black and white plates from Etsy. I'll send you pics when it is complete. Thank you for the inspiration. LOVELY inspiration. who could have thought that plates could be art! ;) so pretty. happy weekend! 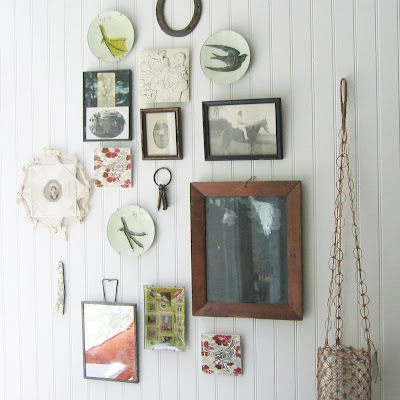 I love plate walls - although NOT putting them up. Just enjoying them after! 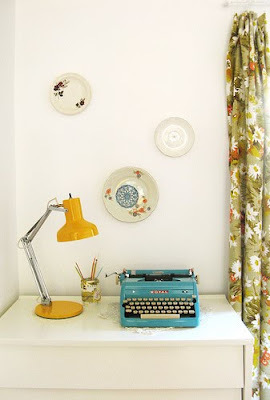 What a great post, I love plate walls. Box Interior Design recently designed a restaurant in Vancouver and installed XL plates inspired by designer Piero Fornasetti. Enjoy! i agree..with the right plates this can be stunning. Hope you had a fantastic weekend dahling! one of these days, i would love to have a guest room with two little beds! 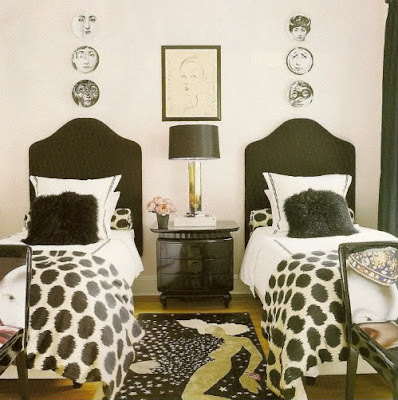 I love how symmetrical the black and white room is!